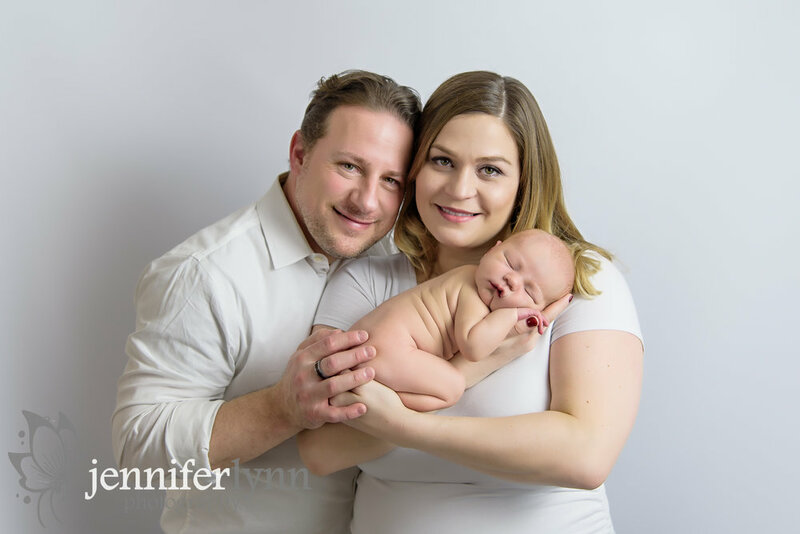 After meeting this family for maternity photos and having the honor to document Samuel's birth with a Fresh 48 at the hospital, this little guy finally came by the studio for his official newborn session. I think he'd gotten even cuter than when I'd seen him just a few days earlier! He was still perfectly curly, sleepy, and ready for photos. For me it's always so fun to see clients again, and it's a special treat to watch clients become parents. I remember when my own daughter was born and the roller coaster of emotions of extreme joy coupled with exhaustion and awe. That's partly why I love the family photos taken during the newborn session. The love for the new baby is so tangible and you don't have to tell a parent twice to snuggle in close to their newest little one. 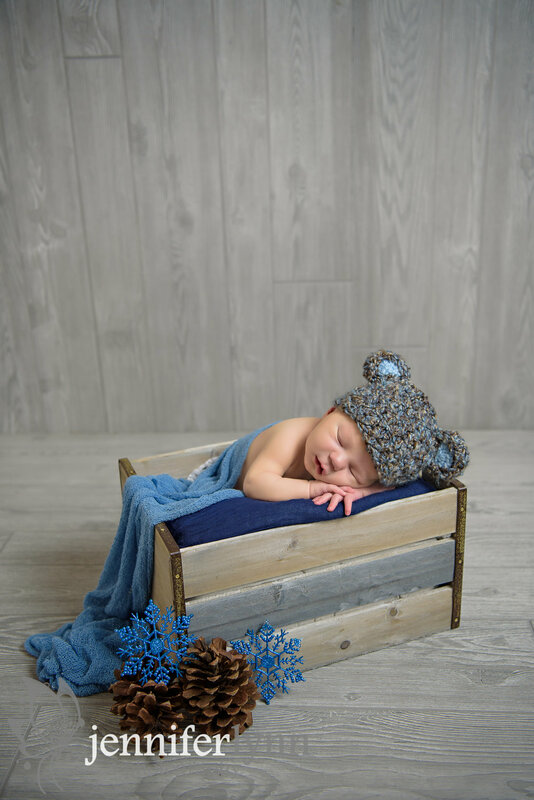 Samuel was a perfect little visitor and slept his entire session. 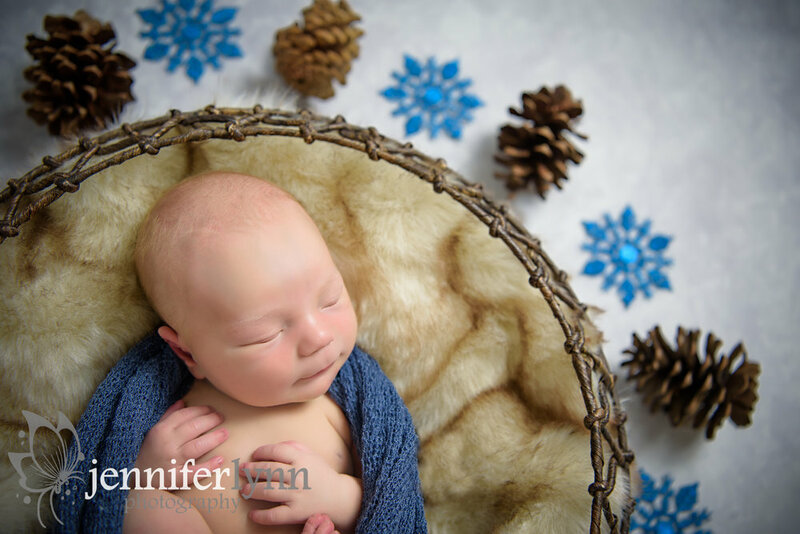 I got to incorporate some new blue snowflakes into his color scheme of blue and grey, and I love how they paired so well with the pinecones and round basket! I think it's always fun to add a touch of something different and unique to a session, and Samuel got a little touch of winter. Another big thanks to his parents for trusting me with such special memories and portraits of your new family of three. Samuel is absolutely precious and I've enjoyed getting to know all of you over the last few months.